Yesterday morning I got an email from my friend Charlie. Usually, when Charlie Bowden takes some time out of his day to share something with me, it’s because he’s found something that connects the stuff I love with something I probably haven’t thought about yet. Yesterday he emailed me about Exploding Kittens. About a month ago, a few guys launched a Kickstarter for a card game called “Exploding Kittens”. A month later, they had the 3rd most funded Kickstarter campaign in history clocking in at just under $9 million bucks. Truth be told, this Kickstarter opened with a bang thanks to it’s creators’ networks, not the least of which includes everyone’s favorite internet cartoonist Matthew Inman aka “The Oatmeal”. And when I say “bang”, I mean that they beat their funding goal of $10,000 and had over $1 million pledged in the first 7 hours. But it’s not just the financial milestone that’s notable, nor why Charlie emailed me. What’s amazing is that Exploding Kittens had the biggest backer-base in history by a factor of 200%+…and that’s ahead of a campaign to bring back Reading Rainbow…a massively mainstream piece of nostalgia for millions of people my age, led by a real deal celebrity, LeVar Burton. So…hang on. What’s the difference between any collection of backers…and an actual community? Yes. I admit it. I backed Exploding Kittens. I learned a lot form just committing a few dollars though. This Kickstarter was different. The “community” was made up of backers (who contributed $) and were involved in helping spread the word. During the campaign the team challenged the community with “tasks” to unlock stretch goals (so it wasn’t just about money). Most of the tasks were just-for-fun: Tweet photos of 10 people wearing cat ears, 50 people, 100 people, etc. We’ll come back to this unique approach to stretch goals in a moment. But first, a little crowdfunding psychology lesson. 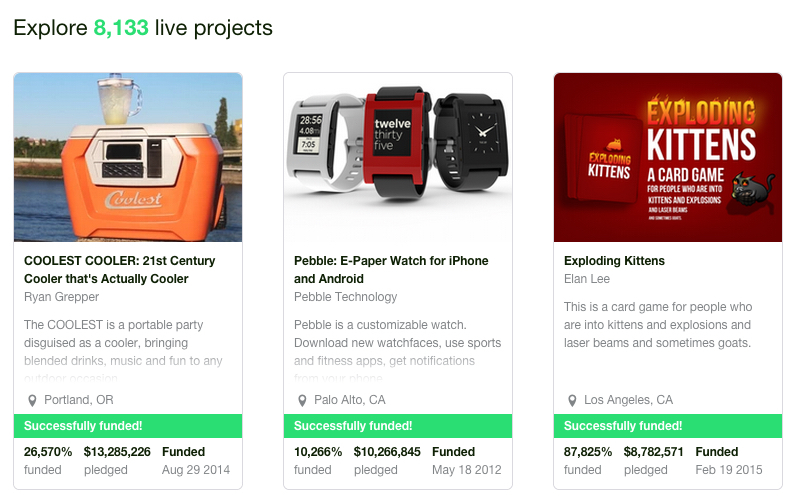 Kickstarter Stretch Goals have become one of the “best practices” for Kickstarter Success. The idea is that once you’ve hit the financial goal you need to call the campaign a success and actually collect the backer money, you can set new financial milestones to encourage more contribution. For example, look at my friend and one of my earliest mentors film projects, “Bokeh” on Kickstarter. When Andy and his team passed the original $35k goal, he offered every backer a digital copy of the musical score from the movie when they hit $45k. They closed their campaign north of $48k. Success! It makes sense, and it works. But let’s look closer. What do stretch goals actually do? It’s easier to convince someone who’s already backed to back a little more, than it is to convince an entirely new backer. The psychology of this version looks something like, “Well, if everybody pitches in just a few more bucks, we all get something extra.” So long as the extra goodies are on point in terms of being desire-able, it’s pretty easy to shake a couple of extra bucks out of a good % of backers. I’d be curious what % of backers increase their amount to fulfill stretch goals. My best guess is that it’s a minority percent…I’d ballpark 10% as a generous estimate but I definitely don’t have data to back that up. If anyone does (hi, Kickstarter) I’d love to know! The other element is that the best person to convince a new backer to join a campaign is someone who has already backed. Campaigns benefit from their backers’ networks and their willingness to share a bit of their trust. This is a MUCH, much harder sell to existing backers. You’re putting the social burden on your backers to talk to their friends about spending money, something that many people find incredibly awkward. And even when people ARE motivated to recruit for you, you’re putting the trust in your backers’ comfort and ability to sell your campaign for you. And let’s be honest – most people loathe feeling “salesy”, and many more are simply terrible at it. I know that a big part of Kickstarter’s advantage is the network effect that they’ve built into their model, and that’s a big part of what carries many campaigns further than they could if they ran an identical fundraiser on their own website or even another crowdfunding website. But I’m curious how the network plays into the performance of stretch goals. Again, this is pure speculation on my part, but I’d be willing to bet that existing backers recruiting new backers is a TINY portion of campaign growth during stretch goals. Again, I’d love to see actual data on that. Both approaches have one thing in common: they’re all about the campaign. They’re designed to draw attention to the product, the object, the creation. And stretch goals work. But what if they could work better? This is what caught my eye in the campaign up date from the Exploding Kittens crew. That, my friends, is the very practice that lies at the heart of Tummling. I normally show that diagram to help people understand why their approach to “community management” is broken, but today, it does a great job of showing the difference between most Kickstarter campaigns and our new champion Exploding Kittens. Although most of the tasks were silly, they also started conversations and helped foster connections. Several people followed me on Twitter based on retweets and favorites. With only 30 days to complete a Kickstarter and not having the benefits of being within the same space with your community the degree of difficulty in creating that magical sense of “belonging” is much higher. As the campaign came to a close this week, the exploding kittens team gave back beyond the boundaries of the community by offering to deliver pizza to any pet shelter that a backer would recommend. Instead of focusing on the one or two outcomes that most stretch hope to goals generate – more money from existing backers and new backers – Kittens focused on the nearly infinite possible things that their backers could do and create together. They were constrained only by the 30 day window and their online gathering place, the comments section. This is how The Oatmeal and friends smashed the previous backer record held by Reading Freaking Rainbow. And this is Tummling at it’s finest. 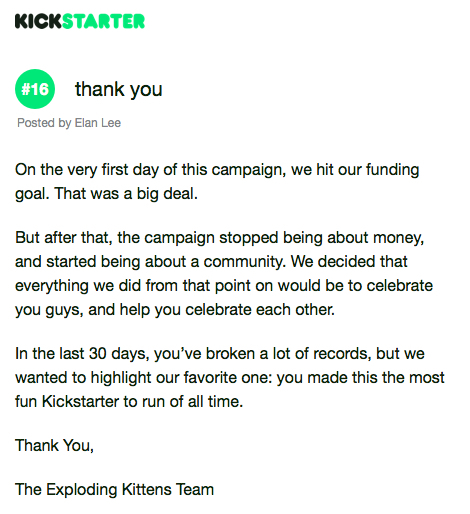 Unlike most Kickstarter stretch goals which put the focus on drawing additional attention to the campaign, the Exploding Kittens crew made it their imperative to draw as much attention as possible to the people who’d already helped make the campaign successful. They made the missions absurd, playing to the strengths and interests of their audience. How did they know what their audience would enjoy? The fact that they spent money on a card game called “Exploding Kittens” is a pretty good clue that their backers would enjoy creative and funny activities. These missions created value for backers, not just value for the campaign. 1. Lurkers is easily the largest population because it includes the people who backed but ONLY watched the crazy missions take place…it also includes those of us who DIDN’T back the campaign, but lurked while the the missions unfolded in the updates, comments, and on Facebook. That’s important and I’ll come back to that in a second. 2. The audience are the lurkers who “show up”. Their presence is visible and important, but they’re not actually doing the missions themselves. Im the case of Exploding Kittens, the backer audience showed up in likes and shares on Facebook. And there’s lots of them. 3. Participants are the backers who are actually stepping up to do the missions, helping unlock the stretch goals. Compared to the Lurker and Audience populations, the Backer Participants is a much smaller group. But without the participants, the backer audience wouldn’t have anything to like and share, and the lurkers wouldn’t have anything to watch. 4. The champions help participants participate. 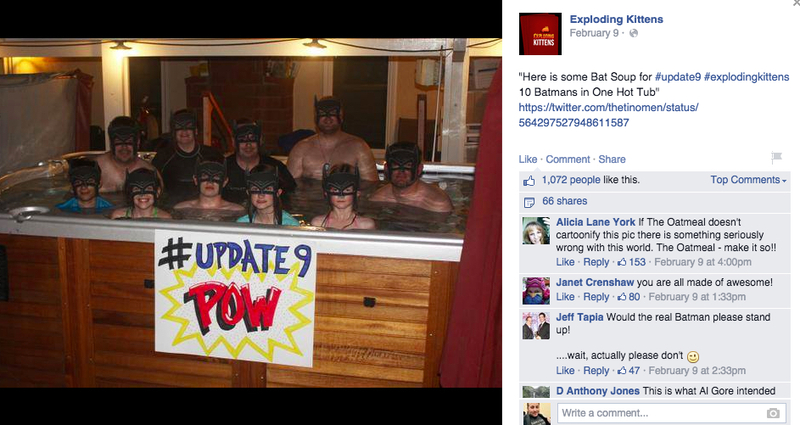 Of course, the Exploding Kittens crew themselves are champions of this community, but so are the individuals who organized the group challenges…like getting 10 batmans into a hot tub. The champions are the enablers. And I can’t think of a picture that says “enabling” better than the one above. Every single mission gave each of these 4 groups of people a new way to connect with each other in the way that best suited them. My point about Observers including people who haven’t backed yet is important to consider because every mission being performed by hundreds and thousands of people became the most incredible invitation to be a part of the fun. Which is a much more exciting and enticing offer than “become a backer and get a funny deck of cards”. Every observer is loaded with potential contributions to your project…including multiple potential ways to help the campaign succeed before they ever contribute a dime. You’re probably thinking to yourself, “that’s all great, but I’d never be able to get $1 Million in my first 7 hours so this TOTALLY doesn’t apply to me. The fact that Exploding Kittens was successful out of the gate wasn’t their greatest feat. It was that they CONTINUED to be successful for the entire duration of their 30 day campaign. So even if your goals and your existing audience are much more modest, you can use this Tummling-style approach to reach your goals faster, and make far better use of stretch goals. 1. Make your campaign about your backers, NOT about you or your project. You have to celebrate them, and help them celebrate each other. 2. Give people more ways to contribute than money and “sharing”. Rethink stretch goals. And goals in general. Goals tied to short term financial milestones only have two potential outcomes: you reach the goal or you don’t. Alternatively, inviting your community into participate in activities and to celebrate each other means that even if someone doesn’t contribute a dime, their participation increases the value of being a backer AND invites new potential backers to the campaign. It’s going to be interesting to watch campaigns in the future attempt to recreate the success of Exploding Kittens. You can be certain that we’ll see people attempt to copycat the “achievements” approach to stretch goals, and fail. The difference between success and failure with this approach is how well you know your community. Exploding Kittens missions weren’t successful because they were silly, they were successful because the community was silly and the missions matched.